Cornelius Vanderbilt (1794-1877), American industrialist, born on Staten Island, New York. He entered the transportation business at the age of 16 when he established a freight-and-passenger ferry service between Staten Island and Manhattan. He owned a fleet of schooners during the War of 1812, entered the steamer business in 1818, and bought his first steamship in 1829. Rapidly expanding his operations, he became a vigorous competitor, reducing his rates and simultaneously improving his ships. Vanderbilt soon controlled much of the Hudson River trade; when his rivals paid him to take his traffic elsewhere, he set up routes from Long Island Sound to Providence, Rhode Island, and Boston. Ruthless in business, Cornelius Vanderbilt was said by some to have made few friends in his lifetime but many enemies. His public perception was that of a vulgar, mean-spirited man who made life miserable for everyone around him, including his family. In his will, he disowned all his sons except for William, who was as ruthless in business as his father and the one Cornelius believed capable of maintaining the business empire. At the time of his death, Cornelius Vanderbilt's fortune was estimated at more than $100 million. Yet, Vanderbilt lived in a modest home; it was his descendants who built the the great Gilded-Age mansions that bear his name. He gave to charitable causes, including funding for what would become Vanderbilt University. Vanderbilt was the fourth of nine children born in Port Richmond, on Staten Island in New York City to Cornelius Vanderbilt and Phebe Hand, a family of modest means. He stopped going to school at age 11. At age 13, he helped his father with the shipping around the New York Harbor. His great-great-great-grandfather, Jan Aertson, was a Dutch farmer from the village of De Bilt in Utrecht, the Netherlands, who emigrated to New York as an indentured servant in 1650. The Dutch "van der" was eventually added to Aertson's village name to create "van der bilt," which was eventually condensed to Vanderbilt. Most of Vanderbilt's ancestry was English, with his last ancestor of Dutch origin being Jacob Vanderbilt, his grandfather. On December 19, 1813, Cornelius Vanderbilt married his cousin and neighbor, Sophia Johnson, daughter of his mother's sister. He and his wife had 13 children, one of which, a boy, died young. During the War of 1812, he received a government contract to supply the forts around New York City. He operated sailing schooners, which is where he gained his nickname of "commodore." In 1818, he turned his attention to steamships. The New York legislature had granted Robert Fulton and Robert Livingston a 30-year legal monopoly on steamboat traffic. Which means competition was forbidden by law. Working for Thomas Gibbons, Vanderbilt undercut the prices charged by Fulton and Livingston for service between New Brunswick, New Jersey, and Manhattan—an important link in trade between New York and Philadelphia. He avoided capture by those who sought to arrest him and impound the ship. Livingston and Fulton offered Vanderbilt a lucrative job piloting their steamboat, but Vanderbilt rejected the offer. He said "I don't care half so much about making money as I do about making my point, and coming out ahead." For Vanderbilt, the point was the superiority of free competition and the evil of government-granted monopoly. Livingston and Fulton sued, and the case went before the United States Supreme Court and ultimately broke the Fulton-Livingston monopoly on trade. In 1829, he struck out on his own to provide steam service on the Hudson River between Manhattan and Albany, New York. By the 1840s, he had 100 steamships plying the Hudson and was reputed to have the most employees of any business in the United States. During the 1849 California Gold Rush, he offered a shortcut via Nicaragua to California thus cutting 600 miles (960 km) at half the price of the Isthmus of Panama shortcut. Vanderbilt's involvement with early railroad development led him into being involved in one of America's earliest rail accidents. On November 11, 1833, he was a passenger on a Camden & Amboy train that derailed in the meadows near Hightstown, New Jersey when a coach car axle broke because of a hot journal box. He spent a month recovering from injuries that included two cracked ribs and a punctured lung. Uninjured in this accident was former President of the United States John Quincy Adams, riding in the car ahead of the one that derailed. 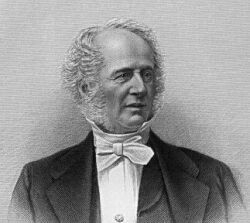 In 1844, Vanderbilt was elected as a director of the Long Island Rail Road, which at the time provided a route between Boston and New York City via a steamboat transfer. In 1857, he became a director of the New York and Harlem Railroad. In the early 1860s, Vanderbilt started withdrawing capital from steamships and investing in railroads. He acquired the New York and Harlem Railroad in 1862-1863, the Hudson River Railroad in 1864, and the New York Central Railroad in 1867. In 1869, they were merged into New York Central and Hudson River Railroad. Looking out the north end of the Murray Hill Tunnel towards the station in 1880; note the labels for the New York and Harlem and New York and New Haven Railroads; the New York Central and Hudson River was off to the left. The two larger portals on the right allowed some horse-drawn trains to continue further downtown. In October 1871, Vanderbilt struck up a partnership with the New York and New Haven Railroad to join with the railroads he owned to consolidate operations at one terminal at West 42nd Street called Grand Central Depot, which was the original Grand Central Terminal, where his statue reigns today. The glass roof of the depot collapsed during a blizzard on the same day Vanderbilt died in 1877. The station was not replaced until 1903-1913. By 1873, he had extended the lines to Chicago, Illinois. Around this time Vanderbilt tried to gain control of the Erie Railroad, which brought him into direct conflict with Jay Gould, who was then in control of the Erie. Gould won the battle for control of the railroad by "watering down" its stock, which Vanderbilt bought in large amounts. Vanderbilt lost more than $7 million in his attempt to gain control, although Gould later returned most of the money. Vanderbilt was very accustomed to getting what he wanted, but it seems that he met his match in Jay Gould. Vanderbilt would later say of his loss "never kick a skunk." In fact, this was not the last time that Gould would serve to challenge a Vanderbilt. Years after his father's death, William Vanderbilt gained control of the Western Union Telegraph company. Jay Gould then started the American Telegraph Company and nearly forced Western Union out of business. William Vanderbilt then had no choice but to buy out Gould, who made a large profit from the sale. After the death of his wife, Vanderbilt went to Canada where, on August 21, 1869, he married a cousin from Mobile, Alabama, Frank Armstrong Crawford. Ms. Crawford's mother was a sister to Phebe Hand Vanderbilt and to Elizabeth Hand Johnson. Ms. Crawford was 43 years younger than Vanderbilt. It was her nephew who convinced Cornelius Vanderbilt to commit funding for what would become Vanderbilt University. Ruthless in business, Cornelius Vanderbilt was said by some to have made few friends in his lifetime but many enemies. His public perception was that of a vulgar, mean-spirited man who made life miserable for everyone around him, including his family. He often said that women bought his stock because his picture was on the stock certificate. In his will, he disowned all his sons except for William, who was as ruthless in business as his father and the one Cornelius believed capable of maintaining the business empire. At the time of his death, Cornelius Vanderbilt's fortune was estimated at more than $100 million. He willed $95 million to son William but only $500,000 to each of his eight daughters. 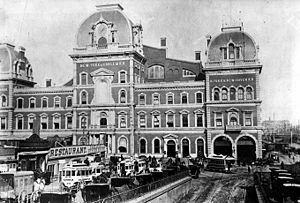 His wife received $500,000 in cash, their modest New York City home, and 2,000 shares of common stock in New York Central Railroad. Vanderbilt gave some of his vast fortune to charitable works, leaving the $1 million he had promised for Vanderbilt University and $50,000 to the Church of the Strangers in New York City. He lived modestly, leaving his descendants to build the Vanderbilt houses that characterize America's Gilded Age. Cornelius Vanderbilt was buried in the family vault in the Moravian Cemetery at New Dorp on Staten Island. Three of his daughters and son Cornelius Jeremiah Vanderbilt contested the will on the grounds that their father had insane delusions and was of unsound mind. The unsuccessful court battle lasted more than a year, and Cornelius Jeremiah committed suicide in 1882. Vanderbilt is the great-great-great grandfather of journalist Anderson Cooper. Some say that potato chips were invented after Native American chef George Crum grew tired of Vanderbilt's complaining about how his potatoes were too thick, too soggy, and not salty enough. Crum then decided to slice the potatoes as thin as possible and fried them, creating the first potato chips. In Atlas Shrugged, Ayn Rand roughly based her character, Nat Taggart, on Cornelius Vanderbilt. ↑ Dale Berry, Railroad History Story: Jackson's Evolution as a Rail Center, Michigan Railroads.com, 2008. Retrieved January 3, 2008. This page was last modified on 7 July 2016, at 16:04.